It’s impossible not to notice, the Defeat of Jesse James Days have arrived in our historic, scenic, and authentic downtown. The annual celebration of the citizen-driven defense of our community back in 1876 has begun. 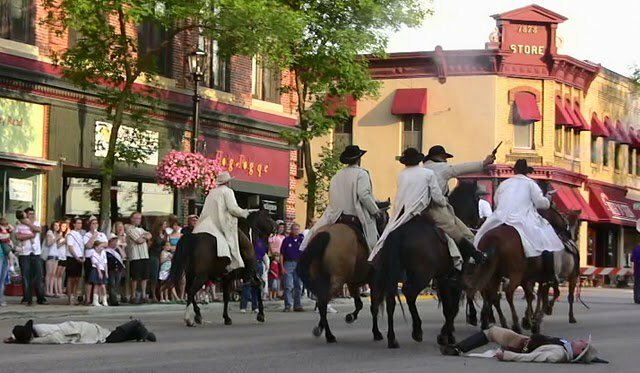 However, the Raid Re-enactments aren’t the only thing going on this weekend in Downtown Northfield. Thursday, September 9th, Defeat of Jesse James Days, 5 p.m. to 12:30 a.m., Bridge Square, Occasional Jazz, 5 p.m., Contented Cow, Jesse, 7 p.m., Grand Event Center, Jessie Jane’s Jamboree, 7:30 p.m., Northfield Arts Guild Theater, Mark Mraz, 8 to 11 p.m., Tavern Lounge, Allyson Road Band, 8 to 10:30 p.m., Contented Cow, Big Strong Men, 11 p.m. to 1 a.m., Contented Cow, and Karaoke at Froggy Bottoms. Friday, September 10th, Defeat of Jesse James Days, 4 p.m. to 1 a.m., Bridge Square, New Moon Trio, 5 to 8 p.m., Butler’s Steak & Ale, Carey Langer, 5 p.m., Contented Cow, Bridgewater Ramblers, 7 p.m., Contented Cow, Jesse, 7 p.m., Grand Event Center, Jessie Jane’s Jamboree, 7:30 p.m., Northfield Arts Guild Theater, Jeff Ray, 8 to 11 p.m., Tavern Lounge, Chance Meeting, 8 p.m., Butler’s Steak & Ale, Marty Anderson & the Goods, 9 p.m., Contented Cow, TV and the Bellered Yellers, 10 p.m., Grand Event Center, Ben Cook-Feitz, 11 p.m., Contented Cow, and D J Music at the Rueb’N’Stein. Saturday, September 11th, Defeat of Jesse James Days, 12 p.m. to 1 a.m., Bridge Square, Farmers’ Market, 9 a.m., Riverside Park, Riverfront Arts & Crafts Festival, 10 a.m. to 5 p.m., Cannon Riverside, Booksigning: The Minnesota Table, 11 a.m. to 1 p.m., Just Food Co-op, Jesse, 12 and 3 p.m., Grand Event Center, Vintage Baseball Game, 1 p.m., Memorial Field, The 2 of Hearts, 1 p.m., Contented Cow, Jessie Jane’s Jamboree, 2 and 7:30 p.m., Northfield Arts Guild Theater, Chubby Bacon, 3 p.m., Contented Cow, Wendy Russell, 6 p.m., Butler’s Steak & Ale, Toaster Fork!, 7 p.m., Contented Cow, Tony Newes, 8 to 11 p.m., Tavern Lounge, The Big Twang, 8 p.m. to 12 a.m., Grand Event Center, Reformation Band, 8 p.m., Butler’s Steak & Ale, Matt Arthur & the Bratlanders, 9 p.m., Contented Cow, and TV and the Bellered Yellers, 11 p.m., Contented Cow. Sunday, September 12th, Defeat of Jesse James Days, 12 p.m. to 6 p.m., Bridge Square, Riverfront Arts & Crafts Festival, 10 a.m. to 5 p.m., Cannon Riverside, Minnesota Pipe and Drum Corps, 4:30 to 6 p.m., Contented Cow, Politics and a Pint, 6 p.m., Northern Roots Session, 7:30 p.m., and Quiz Night, 8 p.m., all at the Contented Cow.